The MiDAS accreditation demonstrates to passengers and their families that the driver of the minibus they are traveling in has the best qualification available to drive such a vehicle and the very important responsibility that this entails. If a driver employed by or representing your organization holds a MiDAS qualification this eliminates the need to hire an outside driver with this qualification and so significantly reduces costs when hiring a minibus. HCT is the only organization in the London Borough of Hounslow that runs regular MiDAS training courses. HCT runs monthly training courses at its offices in central Hounslow and will also run courses on the organizations own premises if this is more convenient eg for schools/colleges where it is not possible for staff to leave their posts for a prolonged period of time. The cost of MiDAS training is £70 per person and the MiDAS qualification (a certificate is awarded) lasts for four years. Please call 020 8572 8204 if you wish to making a booking for MiDAS training or to make enquiries about the additional training HCT can provide. Hounslow Community Transport (HCT) is a longstanding registered local charity that was founded in 1984 to provide wheelchair accessible transport in the London Borough of Hounslow. HCT has developed unique and specialised expertise in this crucial and sensitive area of transport. In 1993, HCT set up the Hounslow Furniture Recycling Project and from 2002 has provided the Shopmobility service in central Hounslow. Hounslow Community Transport is proud to have been awarded PQASSO Level 1 Quality Acreditation, having successfully demonstrated proven effective management and governance of the charity. A total of twelve quality areas, covering all aspects of the management and governance of the charity, were subject to rigorous external verification to receive this award. Open Monday to Friday from 8.30am to 4.30pm and on every Saturday from 10am to 4pm. HCT at 10 Downing Street! 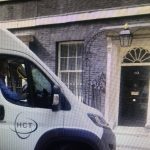 In June 2018 a Hounslow Community Transport minibus took a group of young carers to a function at No 10 Downing Street. The visit was organised by the Youth Service of the London Borough of Hounslow.